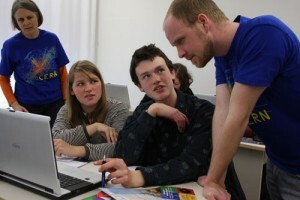 Students and tutors during a masterclass session in 2010 at Dresden University of Technology in Germany. Image: Uta Bilow. March is particle hunting season for more than 8,000 students who participated in the International Hands on Particle Physics Masterclasses. As the Large Hadron Collider is about to again start colliding protons, 130 universities and laboratories in 24 research institutes around the world open their doors and invite high school students to become particle physicists for one day between 4 and 26 March 2011. This year features a premiere: the young researchers are analysing real high-energy proton collisions from the LHC’s 2010 run. These masterclasses have taken place for six years, analysing electron-positron collisions from LEP, CERN’s former collider. “Since proton-proton collision displays are far more difficult to decipher than electron-positron ones, one of the challenges was to find appropriate and easy-to-analyse LHC events,” says Uta Bilow of Dresden University of Technology, who coordinates the masterclasses internationally. The chosen event displays were recorded during the LHC’s first run in 2010 in three of the four LHC experiments: ALICE, ATLAS and CMS. LHCb data will probably be picked up for a future edition of the masterclasses. Using the new data, the physicists from the University of Birmingham in the UK, the University of Notre Dame in the US, CERN in Switzerland, Darmstadt and Dresden in Germany, and the University of Oslo in Norway, who prepared the programme, introduced new concepts this year. Students learned for example how to distinguish background events from interesting ones. “We wanted to give the student accurate insights into the world of particle physics and into particle physicists’ everyday work, which required designing appropriate measurements,” says Michael Kobel of Dresden University of Technology. Physicists even teach student how to look for new particles, like the most wanted Higgs boson or the so-called Z primes, which of course contribute to the excitement of the classroom. 2011 Particle Physics Masterclass in Orsay, France. Image: CNRS/LAL. After a morning session of data analysis, students share and compare their results in the afternoon with students from other countries via videoconference — just like actual particle physicists do within international collaborations. They understand at the same time the essence of healthy competition between researchers. It is also a good opportunity for them to learn that they can obtain results pretty close to and consistent with those officially measured a few months before by the LHC experiments. Students discover at the same time the importance of producing loads of collisions to improve a measurement’s precision. The international particle physics masterclasses take place during the whole month of March. “Things have run amazingly smooth so far, given that 130 institutes in 24 countries had to become accustomed to a completely new framework and completely new measurement task,” said Kobel, co-chair of the International Particle Physics Outreach Group (IPPOG), where he initiated this programme seven years ago. “The excitement of the students is visible in the videoconferences and pays back the huge effort of all having contributed to the organisation.” Of course, not everything runs perfectly: “We will learn and improve,” he says. Nicolas Arnaud from CNRS/LAL in Orsay, France, national organiser – and official French translator at the same time – was teaching at one of the first sessions on 4 March at LAL. He received many thankful remarks from the teachers, who were convinced they should participate again next year. “Some students were maybe a bit young to understand everything,” said Arnaud, “but you could see already that some of them were very excited about every aspects of data analysis.” Students were also very surprised to discover the real physicist’s job is “not as difficult as we thought,” as they eventually said.